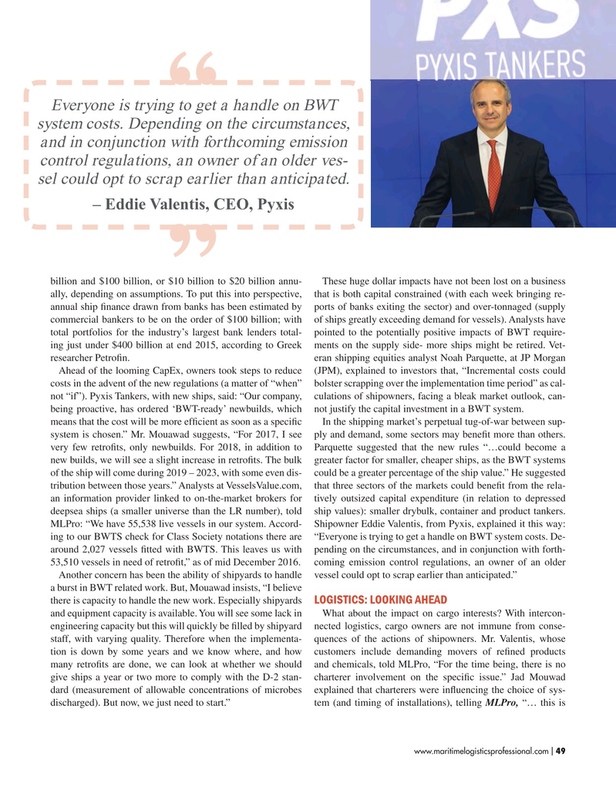 Everyone is trying to get a handle on BWT system costs. Depending on the circumstances, and in conjunction with forthcoming emission control regulations, an owner of an older ves- sel could opt to scrap earlier than anticipated. Ahead of the looming CapEx, owners took steps to reduce (JPM), explained to investors that, “Incremental costs could costs in the advent of the new regulations (a matter of “when” bolster scrapping over the implementation time period” as cal- not “if”). Pyxis Tankers, with new ships, said: “Our company, culations of shipowners, facing a bleak market outlook, can- being proactive, has ordered ‘BWT-ready’ newbuilds, which not justify the capital investment in a BWT system. means that the cost will be more ef? cient as soon as a speci? c In the shipping market’s perpetual tug-of-war between sup- system is chosen.” Mr. Mouawad suggests, “For 2017, I see ply and demand, some sectors may bene? t more than others. very few retro? ts, only newbuilds. For 2018, in addition to Parquette suggested that the new rules “…could become a new builds, we will see a slight increase in retro? ts. The bulk greater factor for smaller, cheaper ships, as the BWT systems of the ship will come during 2019 – 2023, with some even dis- could be a greater percentage of the ship value.” He suggested tribution between those years.” Analysts at VesselsValue.com, that three sectors of the markets could bene? t from the rela- an information provider linked to on-the-market brokers for tively outsized capital expenditure (in relation to depressed deepsea ships (a smaller universe than the LR number), told ship values): smaller drybulk, container and product tankers.